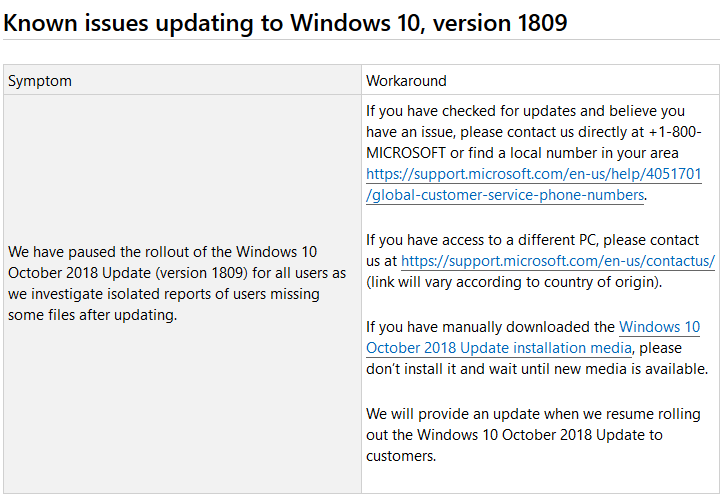 Yesterday evening I was checking Windows Update to see if 1809 was available. It wasn't. So being the tech savy and impatient person I am I decided to use the upgrade assistant instead. I downloaded the assistant and it started downloading. When i woke up this morning the download AND the install had finished (might be a bit scary to some, but okay - I was going to upgrade anyway). I then proceeded to go about my daily routine. Upon opening my music mixing program I noticed something strange. Some of the packaged content had disappeared and so had my user library. Upon further inspection of the containing folders ("C:\Users\Public\Documents" and "C:\Users\<user>\Documents") the files had suddenly completely vanished. On a side-note my user folders ("Desktop", "Documents", "Downloads", etc) have all been moved to my secondary drive by changing their "locations" in their properties. I went a'Googling and tried the usual suspects. I checked "C:\Windows.old\Users" and even tried to read some upgrade logs in "C:\Windows\Panther". The migration log (or "MisLog.xml") mentioned some of the files and folders missing, pointing directly to the files and folders original paths. The reason I think they have been deleted is that my 😄 drive all of a sudden had 90GB free. I regularly check how much space is available on my 😄 drive and the last time I checked it was 30GB. I do not think Microsoft has some sort of secret compression algorithm that can compress all of 60GB of 24bit WAV files into a few gigabytes ( "Disk Clean-Up" says that my previous install files are a total of 24.3GB - and the folders in question is nowhere to be found in "C:\Windows.old\Users"). I've searched my drive(s) for the files and folders in question. Nothing was found. Perhaps they are compressed in some CAB somewhere (does Microsoft still use CABs)? But I can't be sure. I've talked to support and scheduled a phone call tomorrow. I'll update this post with further information after the support session has ended. Don't upgrade untill this issue is resolved. I've also setup a support ticket on the Feedback Hub for those interested in following this case there. Again: be safe. Don't be impatient like I was. I have an old upgrade I can copy over, but I've lost several weeks of work because of this issue. Yep, further proof it's RTM. 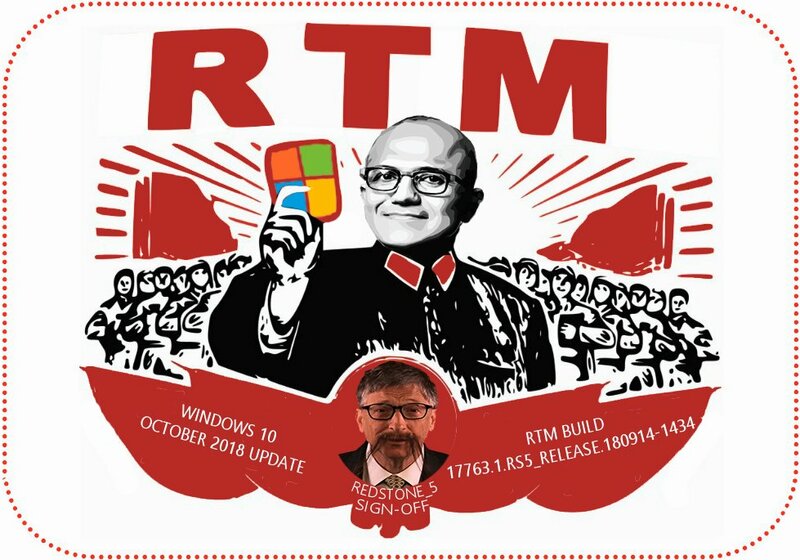 Hopefully no issues as with the previous Spring Update RTM first release build. Thanks. Could you or anyone else tell me what's the difference between these 2 files? And more importantly, What are the chances these are the final RTM? @KP333 Can I ask source of image? 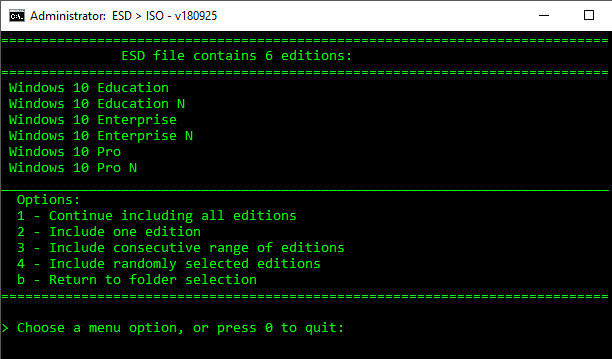 When to expect regular/final ISOs? @KP333 Do u have test decrypt for clientbusiness. I failed. Any solution? The ESD Decrypter @KP333 linked to worked fine for me. @Sylence . What I mean for clientbusiness and decrypt ok for clientconsumer. Do u have tested it. Is it ok.
Oh snap! sorry I only downloaded and tested the client consumer x64. I asked her: Which is the meaning of life? so I guess they will release it soon. other than that there was no problem at all with RS5. it's solid OS. installed all my drivers and programs I needed. the new black theme, the new Windows installation options and screens are great. the only downside to it is Microsoft forcing us to install their Android launcher in order to link up our phone to PC to share pics, clipboard etc. I really don't wanna do that, my built in Oreo launcher is good enough. Sticky note cloud sync sounds useful too, I have yet to test that out. BTW another great thing in RS5. the Memory Integrity in Core Isolation of Windows Defender works perfect! in RS4 when this new feature was first appeared, it was bugged, like you could enable it but after restart it would tell you that this setting is managed by system admin even if you were the only user with admin rights. so the only option was to disable it through system registry. now that problem is gone. Like on most online forums the use of the 'Like / Thanks' button is preferred over simply posting 'Thanks' or something similar.